The International Space Station (ISS) has been undergoing an extensive internal communications hardware overhaul over the past week, designed to greatly boost the orbiting laboratory’s capacity for transmitting experiment data to Earth. The modifications will allow for increased scientific output from the station, which has up until now been running at maximum capacity for data downlink. The communications upgrades are part of the ongoing High Rate Communication System (HRCS) upgrades, which are part of an umbrella program known as the Obsolescence Driven Avionics Redesign (ODAR), the purpose of which is to modernize many of the station’s avionics systems, some of which have designs dating back to the 1990s or earlier. Specifically, the HRCS upgrades comprise three main components – the improved Automated Payload Switch (iAPS) upgrades, the Integrated Communications Unit (ICU) upgrades, and the improved Payload Ethernet Hub Gateway (iPEHG) upgrades. 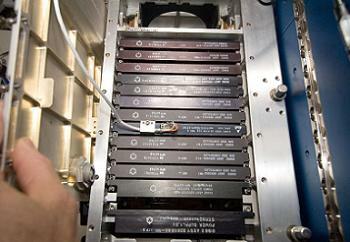 The iAPS upgrades were performed during Expedition 28 in September 2011, which involved installing new circuit cards into the old APS units to convert them into the improved APS (iAPS) units. The APS is essentially a switching unit, which can switch multiple payload data inputs to four outputs that in turn are downlinked to the ground. In other words, the APS controls which payload data streams are downlinked to Earth. There are two APS units on the ISS in total, and since each APS unit has four outputs that can be sent to the ground, the two APS units combined can thus send eight payload data streams for downlink to the ground at any given time. 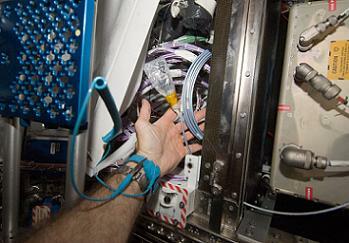 Other HRCS work conducted during prior increments includes cable routing and connector panel installations during Expedition 30 in March 2012. 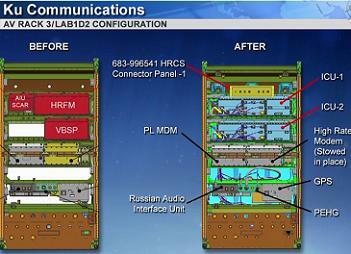 Additionally, although not part of the HRCS upgrades (but still part of the ODAR program), the Enhanced Processor and Integrated Communications (EPIC) card installations into the ISS Multiplexer/Demultiplexer (MDM) computers in January 2012 are of relevance, since said upgrades allowed the ISS to support over 25 simultaneous experiments, when its previous limit had been 12 – a capability that will be exploited by the past week’s modifications to increase experiment data downlink capability. The communications upgrade performed this past week by the Expedition 35 crew, working inside the station’s Destiny laboratory, was the installation of a new Integrated Communications Unit (ICU) – also referred to as a Ku comm unit – which has greatly expanded the capabilities of the Ku-band system. 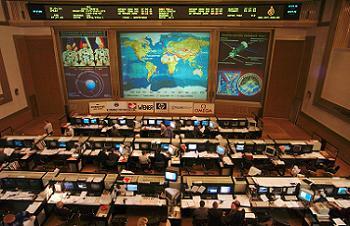 The ISS Ku-band system is used for downlinking high rate data such as video and payload (experiment) data. Lower-rate data, such as commands, telemetry, and audio, are downlinked via the S-band system. The Ku-band system sends its data to Tracking and Data Relay Satellites (TDRS) in geosynchronous orbit via a Space to Ground Antenna (SGANT) outside the ISS. The TDRS, in turn, forward the data down to ground stations on Earth. 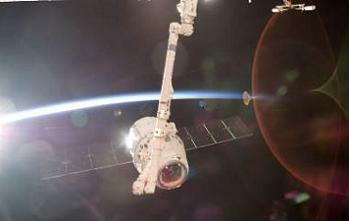 There are two SGANTs on the ISS, both of which resemble satellite dishes and sit atop the Z1 Truss outside the station. The first SGANT was launched integrated into the Z1 Truss on STS-92 in October 2000, and the second SGANT was launched and installed atop the Z1 Truss on the STS-132 mission in May 2010. Under the legacy Ku-band system, the ISS could downlink data to Earth at a bandwidth of 150mbps, via 12 channels – 4 video channels, and 8 payload channels (which came from the two APS/iAPS units). The new Ku upgrades, however, greatly expand on this capacity. Specifically, the new capabilities include a doubling of the Ku-band data downlink bandwidth, from its previous 150mbps to a new rate of 300mbps. The Ku uplink bandwidth has also been increased from its previous 3mbps to 25mbps. The number of video downlink channels have been increased from four to six, and two new Space to Ground (S/G) voice channels have been added (bringing the total number of S/G channels to four). While the legacy Ku system only allowed for the downlink of 8 payload data channels (from the APS/iAPS) at any one time, the new Ku upgrades, when coupled with the aforementioned EPIC upgrades performed in January 2012, allow for the downlink of additional payload data direct from the MDMs, in addition to the 8 iAPS channels. Altogether, this means the ISS will now be able to downlink 64 experiment channels at any one time, a staggering improvement which will allow for the downlink of much more payload data, as the system was previously running at its maximum capacity. Other new capabilities allowed by the Ku upgrades include greatly increased on-board storage of video and payload data, and the ability to command the ISS via the Ku system in the event that the S-band system should fail. 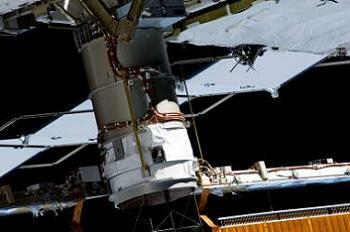 The new ICUs, two of which will be installed aboard the ISS having being launched on HTV-3 and Progress M-16M in July and August 2012 (with a third spare unit manifested for ATV-4 this year), replace many components of the legacy Ku system. Specifically, the old Video Tape Recorder (VTR), which, as its name implies, recorded video onto tape for later playback and downlink to the ground, has now been replaced by Solid State Drives (SSDs) within the ICUs that will greatly increase the amount of video than can be recorded (and thus downlinked). The old VTRs used to send video to the Video Baseband Signal Processor (VBSP) that converted the video into a digital format for downlink, however the VBSP has also now been replaced by the functions of the new ICUs. Other legacy components that have been replaced by the ICUs include the High Rate Frame Multiplexer (HRFM), which was used to multiplex data from the 4 video and 8 payload channels onto a single output for downlink. Additionally, the functionality of the High-rate Communications Outage Recorder (HCOR), which was used to record data from the 8 payload channels (sent via the APS/iAPS) in periods of Ku outage, and the Orbital Communications Adapter (OCA), which was used to route data to the ground from the APS/iAPS units, and vice versa, have also been replaced. The actual work to carry out the latest part of the HRCS modifications began this past Tuesday (April 2), with the Expedition 35 crew first gaining access to the Avoinics-3 (AV-3) rack in the US Destiny laboratory, which is the location into which the two new ICUs will be installed. 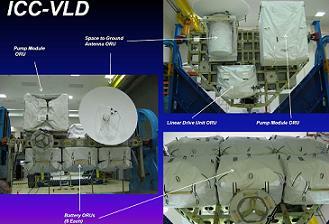 The first step was then to remove the old VBSP unit, and in its place install the ICU-2. However, even this simple task did not go according to plan, as some stiff bolts presented a challenge in getting ICU-2 secured into place. Although some of the bolts were eventually able to be driven via the application of Braycote lubricant, three bolts were still unable to be fully driven, which presented a problem as the bolts are needed to provide sufficient contact force between ICU-2 and its coldplate in the AV-3 rack, so as to allow for adequate cooling. 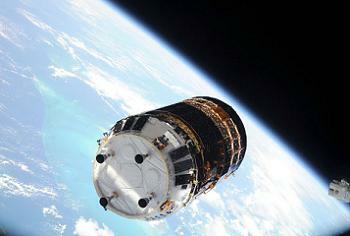 Despite this, it was decided to activate ICU-2 anyway, and monitor temperatures to ensure they stayed within limits. 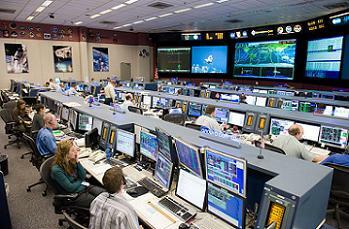 Following activation, an ISS software update was performed and ICU-2 was integrated into the station’s systems – although at this point the legacy Ku system was still operating. On day 2 (Wednesday April 3) – and with the temperatures having remained acceptable overnight – some final cabling was routed for ICU-2, whereupon the actual switchover from the legacy Ku system to ICU-2 occurred. The crew then disconnected the co-ax cable for the Space to Ground Antenna-1 (SGANT-1) from the legacy Ku system, and connected it to ICU-2, thus allowing ICU-2 to actually downlink Ku data via SGANT-1. A series of tests then ensued, which included successful activation of the new 300mbps downlink and 25mbps uplink, successful activation and voice check of the two new Space to Ground (S/G) loops, and the successful activation of the six video channels – two of which were new. However, the ground teams were unable to receive payload data via the new Ku system – which was a disappointment as higher payload data capability was the driving force behind the upgrades. On day 3 (Thursday April 4), and following an overnight investigation into the issue, ground teams determined that the payload data arriving at ICU-2 from the two iAPS units had a different source MAC address than expected, which required a simple software fix, following which payload data began to arrive on the ground via the new Ku system. Checkouts of Russian audio via S/G-3 were then successfully conducted, following which the legacy High-rate Communication Outage Recorder (HCOR) and High Rate Frame Multiplexer (HRFM) were deactivated. A checkout of contingency ISS command via the Ku system was also set to be conducted, in order to demonstrate a very useful redundancy in the event that the S-band comm system (which is nominally used for ISS command) should fail in the future. However, during the test, it was discovered that the Triple Data-encryption Unit (TDU) was not functioning correctly, causing errors and preventing the test from being successfully conducted. The cause of the problem is currently under investigation, although no critical functions or data downlink capability are impacted. Thus, with ICU-2 now successfully installed and operational, the only task remaining is to install ICU-1, currently scheduled for Thursday 11 April. This will involve crews installing ICU-1 into the AV-3 rack, bolting it into place and hooking up connectors using the same procedures as were used for ICU-2. On Friday 12 April, ICU-2 will then be deactivated and the new ICU-1 will be activated, in order to allow the crew to swap the SGANT-1 co-ax cable from ICU-2 to ICU-1, so as to allow ICU-1 to downlink Ku data via SGANT-1. This activity was originally slated to be performed on 11 April, but was delayed to 12 April due to a Russian VIP call on Thursday night that requires an operational video downlink, rather than an untested and uncommissioned video link. As before, a software installation and full checkout of ICU-1 will then be performed, although it is anticipated that the required checkouts will be less extensive than before. ICU-1 will then remain operational, with ICU-2 available as a redundant back-up. However, ICU-2’s use would require the ISS crew to conduct a cable swap to disconnect SGANT-1 from ICU-1 and connect it to ICU-2, in order to allow ICU-2 to downlink Ku data. However, after a US spacewalk (US EVA-21) is conducted on July 2 this year, this cable swap will no longer be required, as ground teams will be able to permanently connect SGANT-2 to ICU-2, and then remotely perform Ku “string swaps” from ICU-1/SGANT-1 to ICU-2/SGANT-2, and vice versa. This is due to the fact that the Space to Ground Transmitter/Receiver/Controller-2 (SGTRC-2) on SGANT-2 is currently failed, which will require it to be swapped out with a new unit during the July EVA. 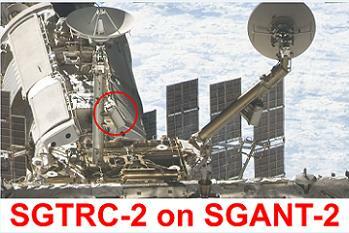 The SGTRC is a critical component as it provides pointing capability to the SGANT dish – and thus, as SGTRC-2 is failed, that means SGANT-2 cannot currently point itself at the TDRS network, preventing data from being downlinked via SGANT-2. ISS managers do not wish to leave SGTRC-2 failed indefinitely, as it leaves the ISS single fault-tolerant to a failure of SGANT-1 or its associated components. Notes from L2’s ISS rolling update section in December 2012 provide more info on the SGTRC-2 failure: “SGANT-2 failed to acquire TDRS – engineers noted a drop in the sum voltage in the SGTRC-2 power, indicating a possible failure in the system. The crew and ground were able to swap Ku-band to SGANT-1. SGANT-2 is currently powered off”. Following the successful conclusion of all the ICU work, the next task to complete the HRCS upgrade program will be to replace the existing Payload Ethernet Hub Gateway (PEHG) units with improved PEHGs (iPEHGs). 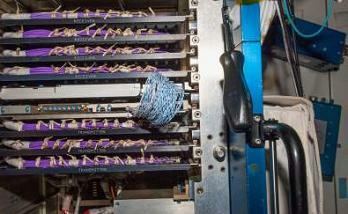 The PEHGs allow experiments to access the medium data-rate Ethernet network aboard the ISS, which is used for command and control of experiments. The iPEHG modifications will allow the Ethernet links to operate at 100mbps instead of its current 7mbps – a more than ten-fold increase. Three of the iPEHGs were launched on HTV-3 and Progress M-16M in July and August 2012, and a fourth was launched on SpX-1 in October 2012. The ISS communications overhaul performed under the ODAR and HRCS programs will allow for a vastly increased flow of payload data between the space station and Earth, which is greatly needed at the present time, as the sheer amount of payloads now operating aboard the ISS at any given moment were straining the previous communications system to its limits. The increase in communications capability shows that the ISS is capable of evolving to meet the ever growing needs of the scientific community, and is direct evidence that despite being designed some 20 plus years ago, the ISS is fit to perform its duty as a 21st century orbiting science laboratory, continuing to serve and benefit mankind in its mission of discovery for a long time to come. (Images: via NASA and L2’s ISS and SpaceX Special Sections – Containing presentations, videos, images, space industry member discussion and more).